-Phone husband at work. Endure taunts about being a wuss. -Take photo of 5-inch spider as proof. -Ask cats and dog for help. Cats snort derisively from top of refrigerator. Dog runs into childrens' bedroom to, um, bravely protect them. -Admire amazingness of spider: the bright pink feet, glossy black fur, big beady eyes. Fangs. -Get broom, colander, bucket, Baygon and mop. Gently prod spider with mop. Yelp and jump on top of kitchen table. Cats jump off of fridge, knocking down baskets of glue, glitter, scissors and other contraband items. -Spider has not budged. Waves front feet bemusedly. -Look sternly at cats. Consider that this is really a small mammal, being too large and hairy to be a proper arachnid. Consider waking eldest son for backup. -Use mop to gently sweep spider down to floor. Cats go to check on dog and children. -I am alone with an enormous scary fanged beast. Call husband to give update. -Nudge spider towards doorway with broom, while brandishing mop in other hand. 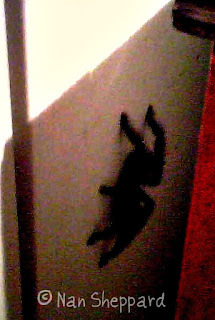 Spider moves towards kitchen cupboards. Leap to close cupboards, lecture spider on unsuitableness of cupboards for spiderly place of abode. Expound on joys of living outside of house. -Continue to push spider gently to doorway. Notice cats peeping in. When the spider has reached the threshhold, give a great sweep, slam door and spray baygon prodigiously over all door- and window-frames. Spray shoes, kitchen cupboards. Consider spraying self. -Go to bed with bag of chocolate chips for company. Yelp when small cat jumps on bed. Cat begins to stalk off again. Entice her back with chocolate chip. Consider moving to Alaska. 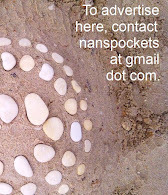 For more fab Blogging and notices of upcoming Magazine Articles, 'Like' Nan Sheppard on facebook and stay tuned! My heart was racing reading this. I. Do. Not. Like. Spiders. That was what I used to do in the olden days before the brown recluse bit me. Now it's chip mittens all the way.